If FairForward looks for new products, we will first see if existing producers, possibly with some support, would be able to make these products. If this turns out not to be possible, a new producer will be sought after within it’s own network, including fellow fairtrade organizations. Fair Trade: Principles & how does it work? At the beginning of 2018 FairForward became a certified member of World Fair Trade Organization (WFTO). This was a logical next step for FairForward (which was part of Fair Trade Original until 2013) as one of the leaders in fairtrade. Being certified goes beyond just selling fair trade products, it means running a fair trade company, in the full operation. Considering the monitoring of the fair trade aspects at our producers there are two ways to go. Most of our trading partners are WFTO member and are certified like FairForward by WFTO. The remaining trading partners are not a member of WFTO and if we want to keep the cooperation with them these trading partners will thoroughly be examined on the fair trade principles using the FairForward Fair Trade Assessment. This instrument is based on the 10 fairtrade principles also used by WFTO. A local consultant will be used for the assessment. Documents will be examined, employees and producers will be interviewed and factories will be visited to be able to check the working circumstances. For each fairtrade principle a color will be assigned: red if the local management does not want to cooperate at making changes on a matter where this is really necessary. Which will mean FairForward will end the cooperation. Orange means changes need to be made on that particular topic directly, yellow stands for less urgent improvements and green means fully complied to the fairtrade principles. 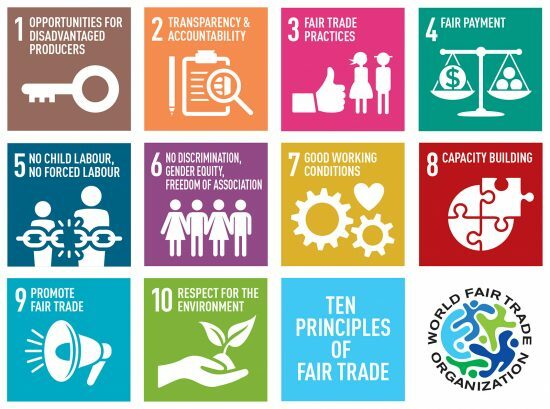 FairForward is a “Guaranteed Fair Trade Organization”, acknowledged by WFTO (World Fair Trade Organization). Our membership is also visible on product labels, assuring you our products are guaranteed Fair Trade. The World Fair Trade Organization (WFTO) is a worldwide network of organizations within the fair trade chain. The membership of WFTO offers fair trade organizations dignity and identity through an international warranty system. WFTO is a worldwide authority when it comes to fair trade and keeper of the fair trade values and principles. WFTO is active in over 70 countries spread over 5 regions (Africa, Asia, Europe, Latin-America and North-America) with global and regional elected boards. Fair trade suppliers are trading partners that procure their products from disadvantaged producers and companies which conduct an explicit social policy. The trading partners, as necessary with Fair Trade Original’s assistance, initiate development within their companies and at their producers and employees. Trading partners with Max Havelaar Fairtrade Seal of Approval certification, where relevant, are assigned priority. Accountability: All players in the trading chain are transparent and maintain clear administrative records. The parties inform each other about important developments in the market and within their organization. Chain responsibility: all those involved in the chain bear the responsibility, on the basis of their position in the chain, for the origin of the raw materials, the quality of the products and production processes and compliance with the fair trade principles. Advance financing: Fair Trade Original offers its partners advance financing of a maximum of 60% of the amount of the order to bridge the period between the acceptance of the order and payment. Long-term trading relationships: Fair Trade Original strives to maintain trading relationships with the organization’s trading partners for a period of at least 5 years, a period required to implement sustainable developments. The trading partners’ (export) expertise is developed gradually, a process which also needs to take account of the occasional relapse. The trading partners are also required to enter into a long-term relationship with their producers and employees. Orders and payments: the purchase and sale agreements concluded within the chain must be understandable and realistic, and must include a explicit specification of the rights and obligations of the parties involved relating to the product (the specifications and statutory requirements) the price and the delivery date. Deliveries must be paid on time. Development premium: this premium is paid – on top of the purchase price, see below – for products with the Max Havelaar Fairtrade Seal of Approval and an increasing number of food products without the seal of approval. The payment of this premium is subject to the condition that the employer forms a democratic, joint body comprised of the employer and employees to decide on the allocation of the premium fund. Fair Trade Original pays the organization’s trading partners a price which is above the cost price. This price must be sufficient to pay the employees an acceptable wage and cover the production and trading costs. This price is set in consultation with the trading partner, in part on the basis of a transparent cost-price calculation. The trading partner in turn negotiates with the producer. When the cost price of a product is structurally excessive then we work with the trading partner on the implementation of cost savings and efficiency improvements. Self-evidently, Fair Trade Original also works on the control of its own costs. The Max Havelaar Fairtrade Seal of Approval guarantees the payment of a fixed minimum price for the raw materials (coffee beans, oranges, grapes) for a number of foods to ensure than the cost of production is covered in a commercially, socially and environmentally-responsible manner. Fair Trade Original uses the EFTA fair trade assessment for all other products to verify that the employees and producers receive an acceptable wage and that the prices are set on the basis of a transparent cost-price calculation. No child labour: fair trade products are made without child labour, i.e. children below the age of 16. When children help then this may never be to the detriment of their schooling, health, or time to play. The trading partners respect the rights of the child. They can demonstrate that they employ no children. No forced labour: every form of violence, compulsion and slave labour is unacceptable. Should any form of forced labour be observed then the trading relationship will be terminated with immediate effect. No discrimination: all producers and all male and female employees (carrying out equivalent work) are entitled to equal payment, equal treatment and equal job opportunities, irrespective of their race, class, caste, skin colour, gender, beliefs, political convictions and social and/or cultural background. Should any form of discrimination be observed then the trading partner will draw up a plan of improvement. The implementation of the plan within the agreed period is supervised. Freedom of organization: the trading partner shall provide its producers and employees the freedom to organize themselves in trade unions or elect employees’ representative committees. An elected employees’ representative committee is formed at workshops with more than 50 employees. This committee represents the employees in negotiations with the management on the terms and conditions of employment and the improvement of working conditions. Fair terms of employment: terms and conditions of employment are agreed in factories and larger, more formal workplaces. These govern the working hours, overtime, holidays, sick leave and pensions and are at least in agreement with the national or international legislation. Moreover, additional efforts are made to improve the employees’ living and working conditions, such as arrangements for a canteen, crèche, loan fund and activities with the personnel. All employees at these workplaces have signed a contract of employment that contains an explicit specification of the terms and conditions of employment. The smaller, still informal workplaces have at least simple personnel records with the signature of each employee. Health and safety at the workplace: the work that is carried out must, within reasonable margins, be both safe and healthy. Should any unhealthy or unsafe work be observed then a plan of improvement will be implemented. (Local) experts can, as required, play a role in this plan of improvement. Trading partners are expected to achieve structural improvements in the capacity of their producers and members. Fair Trade Original has acquired a great deal of expertise in the capacity-building of trading partners and producers. The development programmes, often carried out with on-site experts, constitute an important instrument in development trade. The improvements in their production and trading performance enable our trading partners to develop into reliable suppliers. The expertise they acquire enables them to enter new markets. The objective of capacity-building is to achieve business and social improvements. Business improvements relate to issues such as the implementation of a quality-assurance system, efficiency improvements, product development, improvements to the logistics and packaging, enhanced market information and improved management. These improvements can be implemented at both trade partner and producer level. Social improvements relate to compliance with the fair trade principles such as by improving the working and living conditions, incomes, decision-making capacities and the organization, etc. All players in the trading chain endeavour to minimize the environmental impact of production and trade by the responsible use of natural resources and the responsible management of waste. These activities contribute to a sustainable living and working environment. All players in the chain are familiar with the objectives and principles of fair trade, and inform their customers and suppliers accordingly.